Sony’s SmartWatch 2 to clock in July 15th? So if you for some reason still feel the need to own a watch, yet want something more then just the time strapped to your hand. have i got the product for you…With a slight catch. It seems that the UK retailer Clove Technology has revealed that the successor to the original SmartWatch will be in stock on July 15th. But If you happen to be an American consumer looking to upgrade your wrist-ticker, then you’ll have to wait until September for the international launch. The watch features a 1.6-inch screen that is compatible with any 24mm band. NFC pairing function, Connection Mirroring for controlling and viewing certain aspects of your smartphone and of course Android based apps. 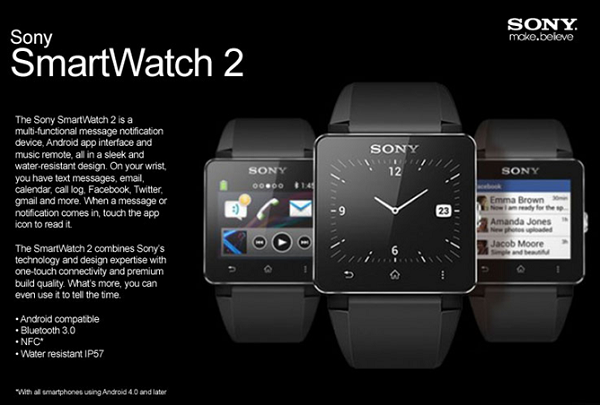 The SmartWatch 2 will retail for £120.00 in the UK. Which would make it seem fairly safe to assume that it’s counterpart will price roughly $180.00. in the States. I guess if you still like the look/feel of a watch this could be a decent product. Especially with the synchronization to your phone for faster notifications. But other then that i still don’t quite see the demand for such an item. But who knows, i might be sporting one of these one day as well. I love watches, and I like things like these, so if I had the money I’d like one. Still it isn’t as expensive as many other watches, but the question is whether or not I’d have use for this. In 2005 I was thinking of a watch with these functions… if this was availabe back then I’d get one for sure. I still think it’s a little pricey for basically an addition to my smartphone. The one major thing i have is it would be just something else i would need to charge about every night. And i’m already terrible about remembering to charge my phone alone. When they come up with better ways of kinetic charging then we’ll be in business.